Ãtma Linga and Sri Nandikeswara.. 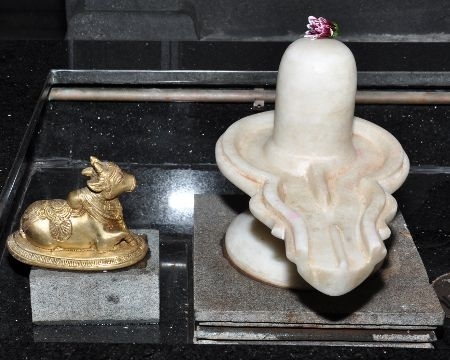 Here is Šiva Linga and Šri Nandikešwara in marble and metal respectively, where devotees can perform a mini abhishekam (divine shower) with a small amount of Ganga jal (water from the holy river Ganges). This is the only sanctum where the devotees themselves can offer the divine bath. In all others, only the priests perform this ritual in order to maintain the sanctity of the Temple.